Blue crabs have a brilliant blue color on their front claws (tips are red on females) with an olive or bluish-green carapace. They have a pair of paddle shaped legs that are excellent for swimming. Crabs can also be identified by the nine marginal teeth behind each eye, with the last pair of teeth ending in a sharp spine. Male and female crabs can be distinguished by examining their apron, which is folded and fitted snugly into a groove on the underside of the crab. The male's apron is long and slender, resembling an inverted "T". A female's apron changes as it matures; an immature female has a triangular shaped apron whereas, a mature female's is rounded. Click here for photographs of these male and female aprons. It is widely distributed from Nova Scotia to northern Argentina, but along the coasts of North America, it is most abundant from Texas to Massachusetts. Blue crabs are distributed throughout the U.S. Atlantic and Gulf coasts. Blue crabs can be found in freshwater areas where salinity is 0 to the ocean where the salinity is full strength (32+ ppt). Adults can grow up to 9 inches. Crabs grow by molting or shedding their shell. Just prior to molting, the crab is encased in both the hard, old outer shell and a soft, new one just beneath it. The formation of a new shell is evident along the margins of the swimming paddles of a crab. The earliest indication of the new skeleton is the formation of a black line along the rim of the paddles. When this line turns pink or red, the crab is referred to as a "peeler" or "shedder". Immediately after the molt, the crab's new shell is pliable and easily stretched. In this condition, the crab is called a "soft crab" or a "soft shell crab". Large amounts of water are consumed prior to and shortly after the molt, causing the soft shell to expand and increase in size. This entire process takes 2-3 hours and within 2 hours after the shed, the new shell begins to harden. The "papershell" is formed within 12 hours and an additional 2-3 days are needed before the shell fully hardens. Blue crabs mate from May to October in the brackish or slightly salty waters of Chesapeake Bay. Just prior to the final molt, an immature female crab, known as a "she-crab", is cradled by a mature male. The female is escorted by the male, commonly referred to as a "doubler", for a few days before and after her molt. During the molt, the male releases the female, but remains nearby. After molting, the female turns on her back and unfolds her abdomen. The male then transfers his sperm to the female. Although the female mates only once, she may spawn several times. The sperm received is stored and used to fertilize the eggs of all future spawnings. After mating, the two crabs resume the cradle carry until the female's shell hardens. Shortly after mating, the now mature female crab, known as a sook, migrates to the saltier waters of the Bay near the ocean. Fertilization of the eggs occurs about 2 to 9 months after mating, from June through September, depending upon when the mating took place. For example, a spring mating would result in a late summer spawn, while a fall mating would result in an early summer spawn the following year. Once the eggs are fertilized females will develop an external egg mass called a sponge on the underside of their abdomen which may contain between 750,000 and 8 million eggs, depending on the size of the crab. These crabs are called "sponge crabs" and hatching of the eggs occurs in approximately 2 weeks after the formation of the sponge. Over the two weeks the sponge gradually turns from orange to brown and then black as the larval crabs develop inside the egg. The newly-hatched larvae are called zoea and look nothing like an adult crab. These young crabs are microscopic in size and drift about in the water currents. It is believed that the majority of these developing larvae are transported into the ocean by an interaction of seasonal winds and bottom water circulation patterns, before eventually returning to settle on seagrass beds in the spawning area. After approximately 6 or 7 molts, the zoea changes into a post-larval form known as the megalops. The megalops has claws like a crab, but can swim and crawl on the bottom. Eventually the megalops settles and metamorphoses to the first crab stage which looks much like an adult crab, but is only 1/5 of an inch from point to point. As these young crabs develop their locomotion, they will migrate away from the high salinity waters near the mouth of the Bay up to more brackish regions. By winter, juvenile crabs can be found as far north as the Susquehanna Flats. Adult males and immature females remain in the brackish waters of the Bay and its tributaries, migrating to shallow grassbeds, shallow muddy bottoms, and/or deeper waters of mid-Bay as temperatures begin to drop in the fall. As winter approaches, most crabs will bury themselves in the mud along channel edges and the shallow grassbeds of the Bay. Female crabs will remain in the higher salinity waters of the lower Bay, whereas males will remain in the upper portions, migrating to deeper waters to spend the winter months. Blue crabs are harvested as hard shell crabs, peeler crabs just prior to molting, and soft shell crabs immediately after the molt. Recreational gears include baited hand lines, mesh rings, collapsible traps, trotlines, and dip nets. Waterfront landowners are also allowed to use crab pots but now their crab pots need to include a Crab Pot Bycatch Reduction Device. Callinectes sapidus means "Beautiful swimmer that is savory". The largest crab recorded from Maryland was a male measuring 9 inches; however bigger crabs (10-11 inches) have been captured in DNR crab surveys. 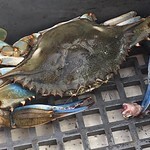 For more information on blue crabs and their management, please contactr Glenn Davis.